In jars, Empire State South: The restaurant’s centerpiece nibble includes deviled ham, pimento cheese topped with bacon marmalade, and boiled-peanut hummus. Chef-owner Hugh Acheson derived the idea from the ubiquitous Southern pickle plate to set a communal tone. Ramen popcorn, Villains Wicked Heroes: Ground ginger, garlic, onion powder, and other spices jazz up the classic movie-watching treat. Eat it alongside an imaginative sandwich made with Korean fried chicken or lamb belly. Assorted snacks, Abattoir: Nibbles arrive on a handsome wooden platter. Highlights include delicate fried ceci peas (the sexier Italian name for garbanzos); puffy, chile-dusted chicharrones; and homemade beef jerky. Bacon in a glass, Leon’s Full Service: Sensational with a bourbon cocktail: slices of Benton’s potent bacon fried crisp and served alongside chef Eric Ottensmeyer’s homemade peanut butter. Elvis would approve. Bombay chili cheese fries, Chai Pani: Decatur’s latest dining triumph features Mumbai-inspired street snacks—some, like this one, with American twists. Fries disappear under kheema (spiced lamb hash), paneer, onions, cilantro, hot sauce, and tomato chutney. 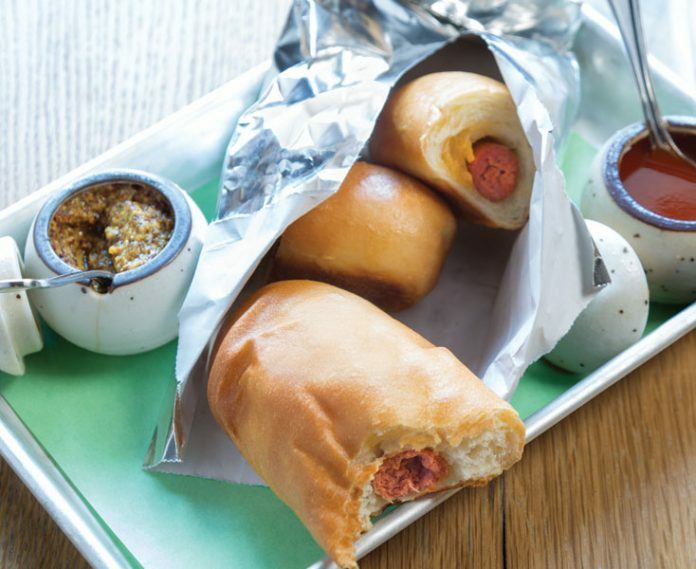 Pigs in a blanket, Proof and Provision: After a show at the Fox, stop by the Georgian Terrace Hotel’s subterranean haunt for a cocktail and a gourmet riff on the classic Americana hors d’oeuvre: all-beef wienies wrapped in potato dough. I met my first bag of Fritos when I was twenty-five. A European friend brought them back as a souvenir from New York. The golden treat from a strange land exploded between my teeth. “Food of the gods,” I remember thinking. Like most French people at the time, I never ate between meals. The concept of a snack, let alone salty and super-crunchy chips in a garish pouch, was as foreign as an alien ritual in a science-fiction novel. I didn’t exactly move to the United States because of that first taste, but I have come to embrace snacking wholeheartedly. In recent years, snacks have been elevated from midday nosh to first-bite nibbles in Atlanta restaurants of all tiers, largely in conjunction with the local (and national) cocktail culture resurgence. Casual establishments are adopting American classics and adding their own spins, and the concept of snacks has even spilled onto the menus of our most accomplished chefs. International snacks are on the upswing too. I’ll never give up my predilection for Fritos, but these whimsical nibbles keep me happily absorbed.